How Much Swag is Too Much Swag? 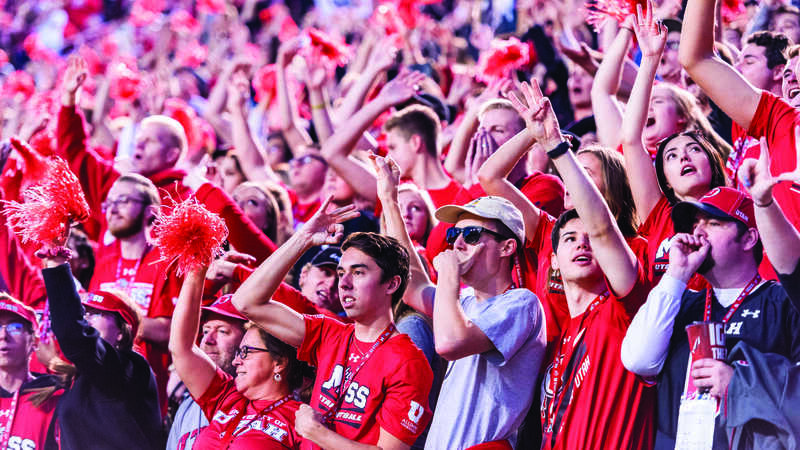 When the Utes play at home, Utah fans show up to show their pride and spirit in a sea of red. Studies show team performance improves fans’ spirits during a game. A home advantage is truly an advantage because more of the home team’s fans are there to support them while distracting their opponents. Cheers and jeers can make or break a game. The sea of red is a sea of support and intimidation. Sweatshirts and hats are all well and good, but at some point getting decked out for the big game becomes excessive, right? Small amounts of face paint, a “U” or eye black is fun and appropriate at a football game. But covering your whole face with red paint seems messy and unnecessary. Let’s not get started on those who decide to go shirtless and paint their entire torso. Of course, body paint washes off at the end of the day, whereas red hair dye is a more permanent show of Utah support. If you decide hair bleach and dye is too much, don’t worry, you can always get a wig from the Utah Red Zone store. In fact, the Utah Red Zone store has everything you could possibly want to be adorned with: a U or drum and feather plus a few things you probably don’t want. Need some U ping pong balls for beer pong? They’ve got ‘em. Red and white Rubix cube to pass the time before the game? No problem. Are your lips chapped after hours of tailgating? Don’t worry, there’s a “U” emblazoned lip balm just for game day. Utah sports memorabilia doesn’t stop at products for humans. A U leash or bandana for your pup is fine, adorable even. However, a doggie-sized sweatshirt with matching booties might be pushing it. You could even make the argument that you’re exploiting a being who can’t make decisions for themselves in order to express your own personal passions. Fido may be a BYU fan and you’re taking advantage of their inability to express themselves. Speaking of exploitation, the number of babies in Utes gear borders on nauseating. Of course, babies need clothes and can’t choose for themselves. It is a parent’s right to pick out as many red shirts and Utes hats for their children as they please. However, dressing up a toddler in a cheerleader uniform or basketball set seems to be overdoing it, except maybe on Halloween. Aren’t we subconsciously determining our children’s future by doing so? What chance do we give our children to make their own choices when we dress them up and drag them to football games from birth? Will they choose a college based on all of those important factors a person should consider when searching for a college, or will they choose a college out of engrained obligation? I could go on and on about how I’ve never been into sports, how I’ve never been overflowing with school spirit, how I find sports fans extra and tailgating ridiculous and yet … When the “Harry Potter and the Deathly Hallows” film came out, there I was at the theater four hours before midnight. I was decked out in a pleated skirt and Slytherin tie, Redvines and a wand in my Hogwarts bag. My friends and I woke up early to make lightning bolt shaped pancakes and marathon all of the movies. All four of my dogs are named after “Harry Potter” characters and sport collars relating to the Hogwarts house of their namesakes. My kids may eventually tire of “Harry Potter” because they didn’t grow up with it the same way I did. I’m still going to dress them up in “Harry Potter” gear every chance I get for as long as they can stand it. I can’t help it, I’m a “Harry Potter” superfan. I bleed red, yellow, blue and green. Nobody could ever tell me there’s such a thing as too much “Harry Potter” swag. So, when it comes down to it, I can’t tell football fans there’s such a thing either. We all have something in our lives that brings out so much joy and passion we can’t help but show it in any and every way possible. So go, let your Utah freak flag fly.